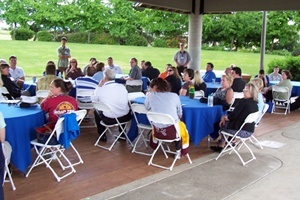 Discussion carried the Neighborhood Summit until dinner was served in the park. On April 13, 2005, NIRSA Executive Director Kent J. Blumenthal, Ph.D., CAE, CRSS, was inducted as a Senior Fellow of the American Leisure Academy (ALA) at the American Alliance for Health, Physical Education, Recreation and Dance (AAHPERD) Conference in Chicago. This fall, college and university students will join with their peers on more than 3,000 campuses across the country to promote National Collegiate Alcohol Awareness Week (NCAAW), October 16-22, 2005. NIRSA Executive Director Kent J. Blumenthal, Ph.D., CAE, CRSS, represented NIRSA at the annual summer meeting of the Council of Higher Education Management Associations (CHEMA), June 3-4, in Minneapolis, MN. NIRSA Education Director Karen Bach and her daughter, Sadie Hartshorn, a junior in elementary education, participated in the Oregon State University Mom's Weekend Look-alike Contest last April. Annual Big Ten Event Offers "A Signature Experience"
Professional Registry Survey on its Way!